Blog Green Marketing - How to make your plant LEED Platinum Certified. Green Marketing – How to make your plant LEED Platinum Certified. Foundries are the “Greenest,” ask Ferrari. We’ll review each of these and provide examples we learned at CASTEXPO 2013 and other significant corporations. We’re using as our example a typical manufacturing plant’s features and characteristics. To follow along, download the LEED Checklist we used as our guide to achieve LEED Platinum writing this blog. With careful planning, patience, learning and follow through companies can achieve this high level of sustainability with a very low investment and significant savings over the life of the facility. We achieved LEED Platinum Certified at our office for $12 per square foot including the USGBC fees. And it’s been the best Green Marketing investment we could ever make. From the Bremen site, “Foundries have been recycling metal for more than 5,000 years. 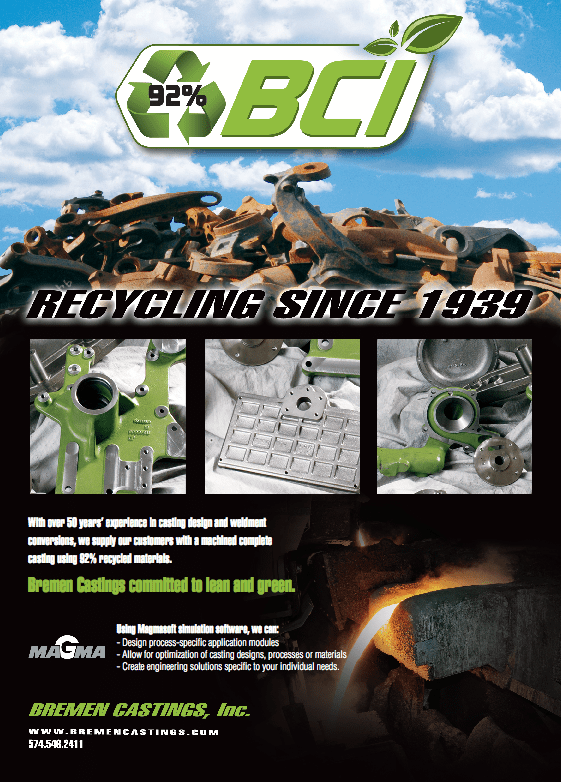 Foundries are the original recyclers, and Bremen Castings purchased 7,829 tons (17,535,980 pounds) of steel scrap last year, producing gray and ductile iron parts for a wide variety of customers and industries.” Red iron can be 100% recycled. High performance steel used to form building 2x4s can typically contain 35% recycled materials. Foundries can help market their products by being able to provide documentation to the end user of the recycled content. Metal recycled in the process of manufacture cannot be counted as recycled. It has to be from another source. Post-consumer content is counted 100 percent. Pre-consumer content is counted at 50%. So to be 100% accepted as recycled content by the USGBC, 100 percent of the metal would need to come from post-consumer sources. Water Efficiency is easy to achieve, as water-saving fixtures are more readily available. From waterless urinals to using rainwater to flush toilets you can easily reduce water use 30% below 1992 U.S. Environmental Protection Agency standards. But LEED doesn’t stop at human water consumption, manufacturing plants also need to reduce water use according to meaningful environmental benefit standards created by their specific industry. Some ice making and washing equipment may be certified Energy Star by the U.S. Department of Energy. We met Closed Loop Recycling at CASTEXPO 2013 and learned that they recycle 100% of their water and divert 100% of extracted waste oil from landfills. From their site, “Closed Loop Recycling will supply absorbent matting and 55 gallon collection drums. We will then come out on a set schedule, restock the clean absorbents and consolidate collection drums for processing.” CEO Rick Marchbanks is on the far right, he started CLR 18 years ago. He’s the real deal when it comes to Green Marketing. Many LEED credits are obtainable in this category. Every one of them pays big dividends over the life of the facility. You can’t get interest rate or payback period at any bank that you can by investing in energy efficiency. It all starts with well insulated and sealed buildings. Onsite solar panels, wind turbines, land fill gas and even sawdust powered boilers can be renewable energy sources for the entire plant. And if you do need to purchase electricity, you can purchase some that is from renewable sources. Commissioning is something that plant managers understand and LEED encourages high levels of energy, water and refrigerant management. From the Melink Corporation site, “Melink is one of the few existing buildings in the world to be net-zero energy. Being net-zero energy means the energy our 30,000 square foot building consumes is offset by on-site renewable energy production from Melink’s solar photovoltaic and wind energy systems.” Melink has grown their business in new areas because of the Green Marketing effects of their LEED Platinum Certification. Materials and Resources – One man’s waste is another’s resource. Building materials will play a large part in your plant’s sustainability. From recycled content materials to purchasing regional materials, they reduce the carbon footprint of the building. Every LEED building is required to recycle consumables such as metal, plastic, glass, paper and cardboard. If you can reuse an existing building or interior system all the better, but for this example we didn’t include those credits. We envision a modern plant built new near a major metropolitan center in the U.S. for our example. Credit is given for rapidly renewable materials such as bamboo and even the castor oil content of foam insulation. And we have included Forest Stewardship Council new wood, which preserves ecosystems by not clear cutting forests. We learned at CASTEXPO 2013 that foundry sand was being recycled in some states as construction fill sand. Also Closed Loop Recycling sells the waste oil it recovers to asphalt companies. 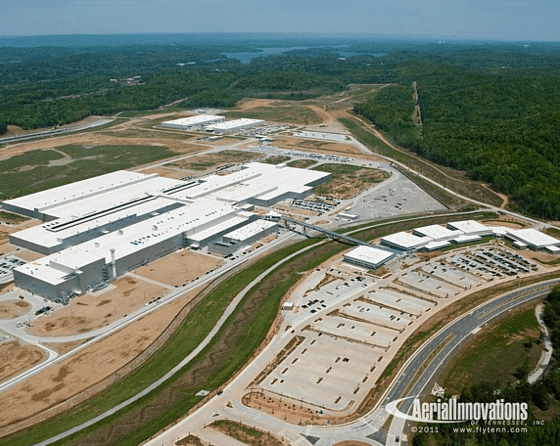 From the VW site, “Volkswagen Chattanooga’s LEED Platinum certification is the fulfillment of a promise that Volkswagen has made around the world and in this community that we will work in harmony with the environment,” said Frank Fischer, CEO and chairman of Volkswagen Chattanooga. “Our commitment to building a LEED certified factory began in the planning and design stages. I believe that this not only helped insure that we would achieve Platinum status, but was actually a very cost effective way to implement environmentally responsible building methods,” he said.” Green Marketing pays for itself! Ferrari’s manufacturing facilities include their own foundry, in-fact all production departments are on their campuses. 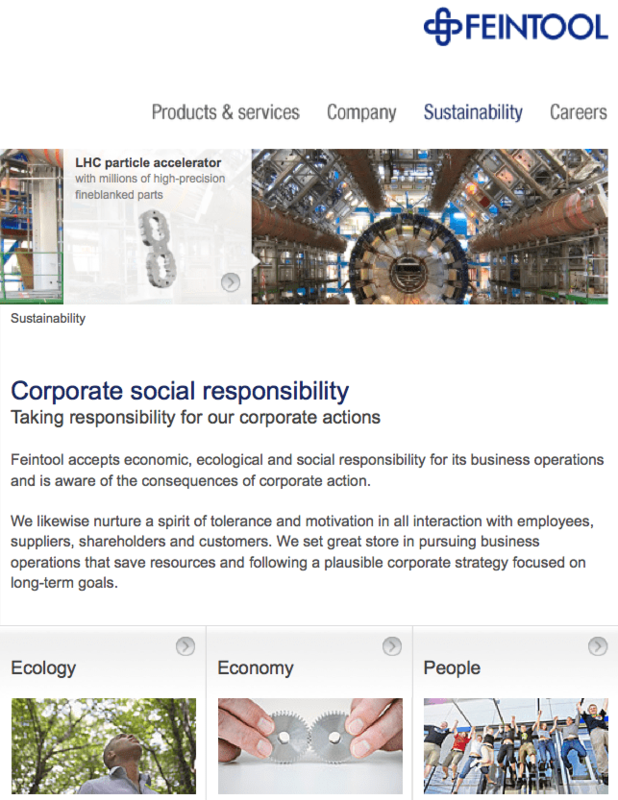 They have started to report their carbon footprint and are making strides to improve it. 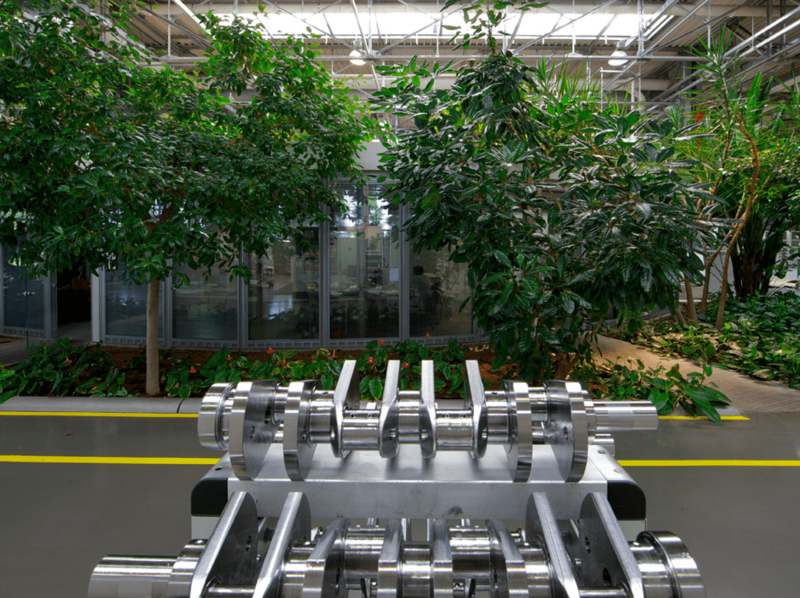 The photo shows one of their machining departments, which include vegetation to absorb CO2 and release oxygen. Photo by Tony Meneguzzo published on the Ferrari site. Original article published in the Ferrari Magazine by Giles Gibbons. Two of the easiest ways to get started is to start tracking you materials and your carbon footprint.